Technology has already taken us to a whole new genre where every bit of information you need is at your fingertips. Just search for the term that you’re looking for and you’ll find every detail about it. One such important application of technology and Internet is in education. Most of the self-proclaimed people nowadays are more proactive to learn something new from the web. The power of searching Google and YouTube tutorials might be enough to get you there but what about the actual expertise and skills that you learn from professional courses and training. Lucky for you, there is a website that would help you to get all those skills based courses online in the form of video tutorials, practice sessions, tests, and certifications. The ITPRO.TV is an online education and certification training website that hosts tonnes of different technical courses for all the IT professionals. So, without any further discussions, let’s dig a deeper into all the stuff that this website offers. ITPro.tv is aimed to revolutionize the way all the other sites offer online education and training courses. It has compiled so many courses that are deployed in the form of live streaming content and on-demand videos. Though there are many other websites like Udemy & CBTNugget's who also offer online certifications for short and long term courses like any Language (PHP, C++) and other Data, Structure related courses, but they don’t yet have any course offerings via on-demand tutorials. The website has successfully teamed up with streaming services like Apple TV, Roku, Amazon Fire TV and much more to provide all its users with the ease to view the training sessions and course tutorials anywhere on their devices. From smartphones to smart TVs, you can avail the content everywhere. Want to get started with all the learning and stuff, then the first step that you need is to sign up on the ITPro.Tv website. Create an account, select the course that you want to opt and start learning within a minute. Although it is a premium service with so many fruitful features but still the company offers a trial period during the registration which you can upgrade anytime later. When it comes to providing courses and training certifications, ITPro.tv is a beast with hundreds of different courses that you can start with. From basic MS Office courses like Word, Excel, PowerPoint, etc. to the advanced Adobe software courses for Dreamweaver, Illustrator, In-design, Photoshop, and much more programs that this site offers. Apart from that, the website also offers certification programs like VMware and Data Centre virtualization, Certified Ethical hacking courses, Security Professional and various other advanced programs for the enthusiastic learners worldwide. How much for the Certifications? It is undoubtedly a premium service with all the necessary assets offered to the users for an affordable price. You can, however, watch some of the live sessions free via your devices via the web, Android or iOS devices, Apple TV, Roku, etc. 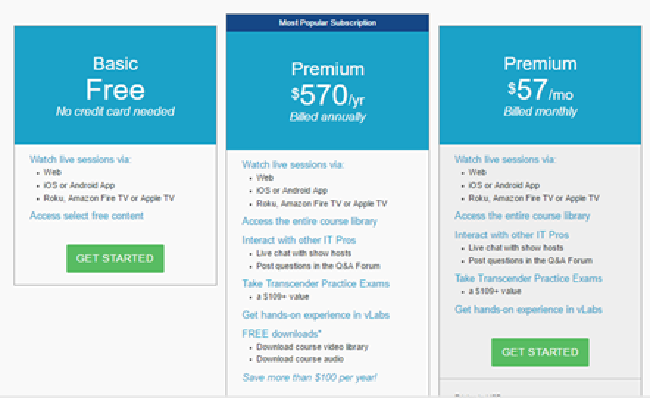 Moreover, the premium subscriptions of the plans are billed annually starting $ 57 per month with some fantastic offers like live chat with the Professionals in the sessions, get your questions answered in the Forums and save huge discounts in the Transcended Practice Exams. However, the annual billings save you up to 20% on the certification cost. Apart from that, you are also entitled to download course videos, audios, etc. Also, you can get hands-on experience with the software and programs in the vLab sessions for better understanding. Where they excel for me? Trained Session hosts and IT Professionals with a vast knowledge to guide you throughout the training. New content uploaded daily in every area of the field. You can avail the live sessions later within 48 hours on demand. Detailed course structures and information provided at every step. Where they fall short for me? Usage tracking doesn’t work that much efficiently. Some of the courses are a little basic and outdated as compared to the pace our technology is moving with. A little bit of a double-edged sword but I the hosts of the live sessions are quite experienced their fields that balance out all the odd points. The video tutorials are quite engaging and knowledgeable as well. So, this was all about ITPro.tv and all the courses offered by the website. The duration of the programs varies from a minimum 1 hr to even 48hrs of learning and professional training. The live sessions are recorded and scheduled at different timings that are mentioned on the website. The membership is compulsive to enjoy any kind of service from the site. The support offered by the site is also remarkable. You can clear the air of doubts by contacting the support team for any query related to the courses and certification programs. Do share your thoughts about this useful website and let me know if you’ve started your training on the site already, in the comment section below. Cheers!